In When Nationalism Began to Hate, Brian Porter offers a challenging new explanation for the emergence of xenophobic, authoritarian nationalism in Europe. He begins by examining the common assumption that nationalist movements by nature draw lines of inclusion and exclusion around social groups, establishing authority and hierarchy among "one's own" and antagonism towards "others." Porter argues instead that the penetration of communal hatred and socialdiscipline into the rhetoric of nationalism must be explained, not merely assumed. Porter focuses on nineteenth-century Poland, tracing the transformation of revolutionary patriotism into a violent anti-Semitic ideology. Instead of deterministically attributing this change to the "forces of modernization," Porter demonstrates that the language of hatred and discipline was central to the way "modernity" itself was perceived by fin-de-siecle intellectuals. The book is based on a wide variety of sources, including political speeches and posters, newspaper articles and editorials, underground brochures, published and unpublished memoirs, personal letters, and nineteenth-century books on history, sociology, and politics. It embeds nationalism within a much broader framework, showing how the concept of "the nation" played a role in liberal, conservative, socialist, and populist thought. 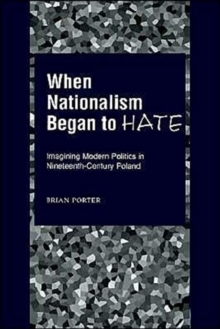 When Nationalism Began to Hate is not only a detailed history of Polish nationalism but also an ambitious study of how the term "nation" functioned within the political imagination of "modernity." It will prove an important text for a wide range of students and researchers of European history and politics.